cColors is creating chibi stickers, magnets, and digital art! My name is ccolors95 but you can call me Colors. I'm a freelance artist actively taking commissions and seeking to improve my ability every day. I stream Creative on Twitch 5 days a week and have 2 of the cutest cats in the world! I made my Patreon page to encourage myself to try new things with art and provide more content for you beautiful people! For the last 10 years, I have been working to improve my ability in drawing anime characters. I've drawn inspiration from different anime, manga, and artists around me to get to this point and I'm still working to improve. I actively take commissions here and am always creating work for others. For Patreon specifically, I aim to make more fan art and pieces that inspire me to grow as an artist. I also make prints, stickers, and magnets of my work as gifts to you all for aiding me in my journey, thank you all for the support! Each month, I create a custom sticker sheet that can only be found on Patreon. I'm currently creating Studio Ghibli sticker sheets, hopefully for the rest of the year! I also create digital coloring pages with accompanying PSD files for you to color in yourself and wallpapers for your desktop and phone. 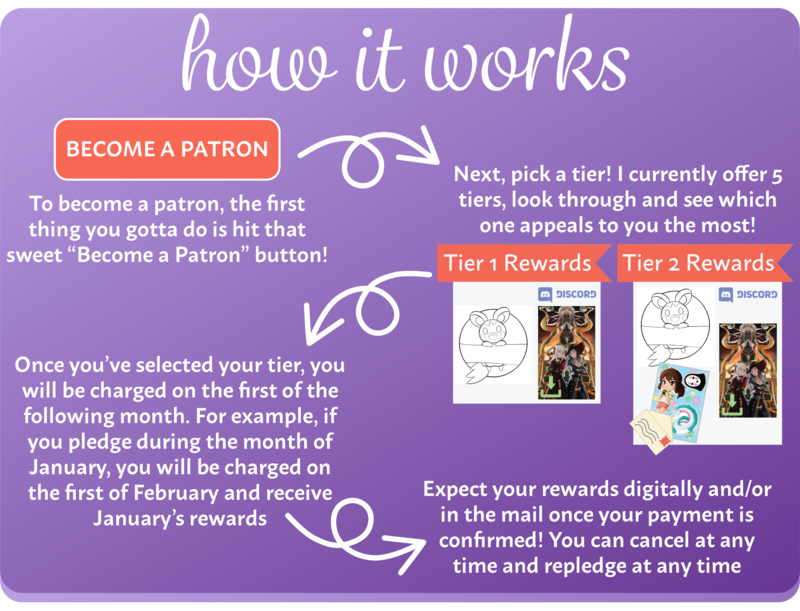 Higher tiered patrons receive prints, magnets, unique traditional artwork, and custom chibis of their choice. In the future, I would love to expand my merchandise to keychains, enamel pins, lanyards, and other creations for you all! Have questions about art, what I do, or suggestions for future content? Let me know! Feel free to message me on here, email me at [email protected], tweet at me , ask during a Twitch stream , or join the discord to discuss your thoughts! I'm always happy to help and eager to listen to suggestions! Thank you so much for all of the support you've shown. Just stopping by to see my page shows you've considered supporting my artwork, and it's people like you that keep me going. If you can't afford to pledge don't feel bad! Be sure to check out my twitch channel for weekly broadcasts, come hang out and have a great time! A digital copy of a coloring page each month! A Patreon-exclusive sticker set each month! A magnet of each month's chibi design from the sticker sheet! 4"x6" Prints of each month's Patreon-dedicated piece(s)! A4 sized prints of each month's Patreon-dedicated piece(s)! My god this goal is INSANE! By reaching this goal, I will invest and send out a monthly charm design! The charm will be between 1 and 2 inches either on wood or acrylic (haven't decided) and available in a newly created tier!